Yes, I know, everyone says it is not compatible. The imaging circle has been trimmed in 5 seconds with some traces on the side due to operator error. It looks alright to me. What do you all think? On the other hand, the MX in the picture will not work with the DA, there is no programmed mode except the M mode. My MX loses all the light seal on the back, I can bet the roll will be a failure with light leaking through the seal on the sides and the mirror bumper loses more than half of the original seal. It is not sticky. I wonder how much it will cost and if at all worth to fix it. Is it worth to fix the MX as I have a good copy of SuperProgram already? The pictures don't lie about the combination in FF bodies. I know all of you are freaking out in reading this small blog post with the FF word on it. Yeah, I couldn't sleep after losing a p.net contest to Matt, the daemon who scored over me with a Pentaxian horny but poetic song with Maria. Truth be told is a nasty cold that I had after a San Francisco China town visit. It wasn't cold at all but I took too many pictures with my FF bodies in the week -- Pentax SuperProgram and Ricoh xr-p. The HELL with digital FF bodies, I have lot more fun with my H1N1 FF bodies, especially when I got to meet the wonderful Henry with FotoExpress in downtown San Jose to develop my FF FF (first full frame films) with scanning. I would have a complete report on the experience with Henry and FotoExpress in San Jose downtown when I get better from my cold and when Matt, my one and only Pentax buddy, leave me alone from my cold and my lost in the contest. Congratulation to Garry and Maria who won the limited bag case from Josh Root, the p.net chief commander in photo.net. Enough confusion from my insomnia with cold, here is the original picture of the film scanning done by FotoExpress from Henry, my best mentor for helping me to execute my nostalgic path back to film in my past youth. No vignetting noticed in Viewfinder from SuperProgram at time of shooting. The coverage of the optical viewfinder in SP is 92%. Why can't I see the imaging dark circle. The darkened circle in the final shot is not centered. More dark edges are seen on the left. It is important to know it is a lefty darkened imaging circle. With that in mind, do compose your frame accordingly. Remember the left is to be trimmed in post processing after FF film scanning. A bummer that I now remember the test may be more to tell as I have the hood mounted at all time as I get used to use the hood on the 21mm limited for protection. When I get my next round of tests, I will shoot the next FF shot without the hood. Love the shot, looking cool. Regarding the MX, send to Eric. Fair price for fixing, and he does a great job. 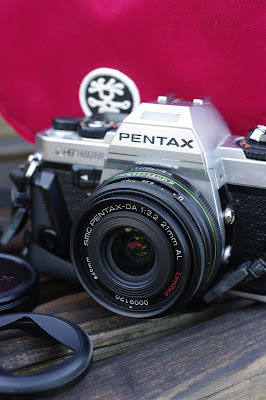 Do a search at PentaxForums film sub-forum. I have sold my SuperProgram and on my long list of to-do item to fix the light seal of my MX. I actually like the SuperProgram for the ability to use with DA 40mm f/2.8. The DA 40 works fantastic in program mode with the SuperProgram. The MX has a better VF but it can't work with any DA lens that is lacking the aperture ring.